In a move seemingly designed to erase all memories of Indiana Jones And the Crystal Skull and that “I am not famous anymore” paper bag-wearing nonsense, Shia LaBeouf has given the world, or at least the internet portion of it, a gift of incalculable value: a shouty, unhinged “motiviational” speech shot in front of a green screen. Just the thing for wisecracking YouTubers to make fun of. 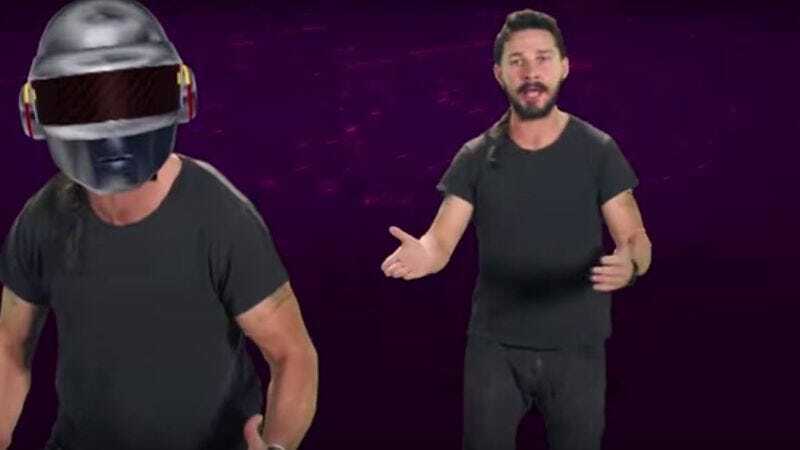 LaBeouf recorded his now-infamous, much-parodied “do it” monologue in a Los Angeles studio as part of a video art project in collaboration with the students at London art school called Central Saint Martins and fully intended the work to be ruthlessly remixed by the public. Actually, there’s a good half hour of LaBeouf reading student-written pieces in front of that green screen, but the internet has seized upon those two testosterone-crazed minutes of LaBeouf screaming encouragement at the camera like a personal trainer crossbred with a USMC drill sergeant. Thanks to YouTubers, Redditors, and Viners of the world, LaBeouf has already been inserted into 2001: A Space Odyssey and cast as an unwanted apartment visitor, among countless other permutations. And now, YouTuber I Lika Da, a multi-instrumentalist whose channel consists of “primarily YTP,” has concocted what, in retrospect, was the natural destiny of the precious, risible LaBeouf footage: a Daft Punk mashup. “Daft Labeouf - Harder, Better, Faster, Do It” shows just how easily the actor’s motivational aphorisms, once properly AutoTuned, blend with the robotic rhythms of the French techno duo. Even the cadence of LaBeouf’s words perfectly matches the melody of the 2001 song, as when he ”sings” lines like “Yesterday you said tomorrow.” I Lika Da’s accompanying video has some fun with the actor’s image, too, giving us multiple, wildly-gesticulating Shias. There are multicolored Shias, a Daft Punk helmet-wearing Shia, and even lots of little Shia heads bouncing around the screen like Plinko chips. Through it all, the message is the same: stop making excuses and just go out there and be great or the guy from the Transformers movies might physically harm you. Those needing motivation at the beginning of the work week need look no further.